A necessity defence allows defendants to argue that actions that would otherwise be illegal are justified by the need to prevent a greater harm - so, for instance, someone who breaks down the door of a burning building to allow people trapped inside to escape is unlikely to be convicted of criminal damage. Following this line of reasoning, people who have taken direct action against the fossil fuels industry and other major sources of climate change have argued, with some success, that their actions were justified by the need to prevent further damage to the environment. A group of people who were charged with causing £30,000 of criminal damage while occupying the UK’s coal-powered Kingsnorth plant in 2006 were eventually acquitted after presenting evidence to the court showing the dangers caused by rising sea levels. 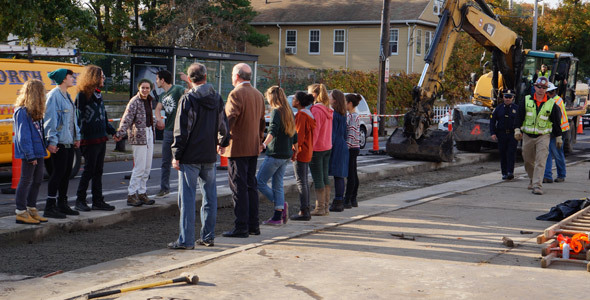 Similarly, in Boston, thirteen people were charged with trespassing, disorderly conduct and resisting arrest for their parts in a 2016 campaign to prevent the construction of a natural gas pipeline, and were eventually acquitted after presenting arguments about both the immediate dangers caused by a potential pipeline explosion, and the more general threat caused by climate change worldwide. The necessity defence of using reasonable force to prevent a crime has also been successfully employed by people taking direct action against the military and the arms trade on a number of occasions. In 1996, four women who caused £1.5 million pounds worth of damage to a British Aerospace Hawk jet that was due to be sold to the Indonesian military were acquitted by a Liverpool court after presenting evidence about General Suharto’s brutal policies in East Timor. In 1999, three people charged with causing £80,000 criminal damage to a Trident nuclear submarine were acquitted in a Scottish court when the sheriff in charge of the case accepted their argument that Trident itself should be viewed as illegal, although the state acted quickly to try and prevent anyone else from being able to use the same argument. A Manchester jury in 2001 also accepted that two people who planned to attack another Trident submarine while it was docked at Barrow-in-Furness should not be found guilty of conspiracy to cause criminal damage. The Raytheon plant in Derry, which supplies weaponry to the Israeli military, has been repeatedly targetted by activists who were mainly acquitted, during both the war on Lebanon in 2006 and the bombardment of Gaza in 2009. In January 2009, as a response to the same attack on Gaza, six people entered the EDO weapons factory in Brighton and caused nearly £200,000 of damages, causing the factory to shut down for weeks. After hearing evidence from witnesses including someone who'd been inside a hospital that was attacked with white phosphorous by the Israeli Air Force, the jury voted to acquit on all charges. 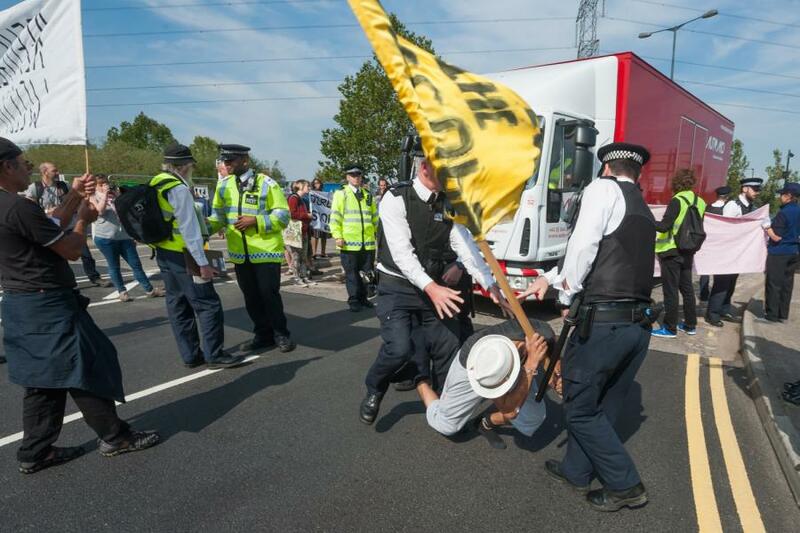 More recently, eight people who blocked the road in an attempt to shut down London’s DSEI arms fair in 2015 were found not guilty after presenting evidence about the UK arms industry’s role in enabling states such as Turkey, Saudi Arabia and Bahrain to carry out atrocities. The Crown Prosecution Service were extremely unhappy about this acquittal, and attempted to have it overturned, but their challenge was thrown out of court in a decision that defence lawyers described as “from shambles to farce” and “a slap in the face” for the CPS. And taking this proud tradition right up to the present day, in October 2017 two people who had attempted to disarm Tornado jets bound for Yemen were acquitted at Burnley Magistrates’ Court, and cheerfully announced that they had no regrets and would do it again "in a heartbeat". As anyone who’s ever seen a cop show will know, people who are arrested have the right to remain silent. But what the famous Fifth Amendment actually says is that no-one can be compelled to “be a witness against himself” - that is to say, that there’s no right to refuse to inform on other people. This means that, in certain circumstances, once people have been granted immunity from prosecution - which sounds like it would be a good thing - they can then be imprisoned for refusing to talk. This makes grand juries a useful tool for the US state to use against social movements, as people can be thrown into prison solely for refusing to inform on their comrades. But while innocent people can be imprisoned coercively by a grand jury, there’s no legal way for them to be imprisoned punitively. This means that the same defiance that landed them behind bars, when kept up consistently enough, can then get them released by allowing their lawyers to file a (wonderfully named) “grumbles motion”, arguing that their imprisonment is not having any coercive effect, and so has to be seen as punitive. Some stories from grand jury resisters are collected here, while one of the clearest examples of the legal logic at work came from the release of Jerry Koch, an anarchist jailed for his refusal to testify before a grand jury in New York. In the judge’s words, “Koch’s argument is straightforward. Because he continues to oppose the government in general and the grand jury process in particular, he urges that continued confinement will not induce him to testify. Indeed, he asserts that his tenure at the MCC has caused his views about government repression to congeal even further.” In a particularly memorable phrase, the judge noted that he was incarcerated for being in contempt of court, but that he promised “continued and endless contempt”, meaning that his incarceration served no purpose. In 1981, the UK was swept by a wave of riots. 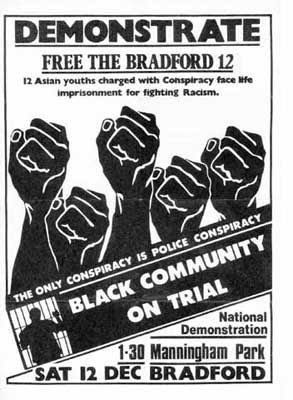 As part of the unrest, West Yorkshire police found a crate of petrol bombs stored in Bradford, and arrested 12 young Asians on charges of making explosive substances. While some of the defendants denied any knowledge of the petrol bombs, the majority took the bold step of admitting involvement, and stating that the petrol bombs were necessary for community self-defence against the National Front; as English law admits for a right of self-defence as long as proportional force is used, the Bradford 12 defendants insisted that making and using petrol bombs should be seen as a reasonable response to campaigns of racist violence. After considering the case, all defendants were found not guilty. Another case with strong echoes of Bradford took place in Rotherham recently, where South Yorkshire Police forced an anti-racist demonstration to disperse using a route that took it past a pub where a group of fascists were drinking; 12 local Asian men were charged with violent disorder after the resulting clashes, but after pleading self-defence, all 12 were eventually acquitted. As part of the intense class war seen in the US in the opening decades of the 20th century, three leaders of the Western Federation of Miners, including the famous wobbly Big Bill Haywood, were tried for blowing up Frank Steunenberg, the former governor of Idaho. The case was widely seen as an attack on the organised working class, and when President Roosevelt described the three as “undesirable citizens”, tens of thousands of people across the country began to wear badges with the slogan “I am an undesirable citizen”. A few days before Haywood’s trial was set to begin in May 1907, huge May Day demonstrations took place across the country, with banners carrying messages like “ROOSEVELT CAN SHOW HIS TEETH - WE ARE NOT AFRAID. WE STAND BY OUR BROTHERS IN IDAHO”. Eugene Debs threw himself into the defence campaign, and called for a general strike in the event of a conviction, asking his fellow workers to prove that they “are not so lost to shame, not so devoid of the red blood of courage, that they will allow one of their comrades to suffer death at the hands of their enemies”. The judge instructed the jury to acquit, and they followed, in a move that was widely seen as an attempt to stave off the mass unrest that would have resulted from a conviction; one historian described Haywood and his co-defendants as having been “saved from the gallows by the militant section of the working class.” Haywood later reminisced about being shown round bars where there were visible dents in the floor from people dancing with joy at the verdict. 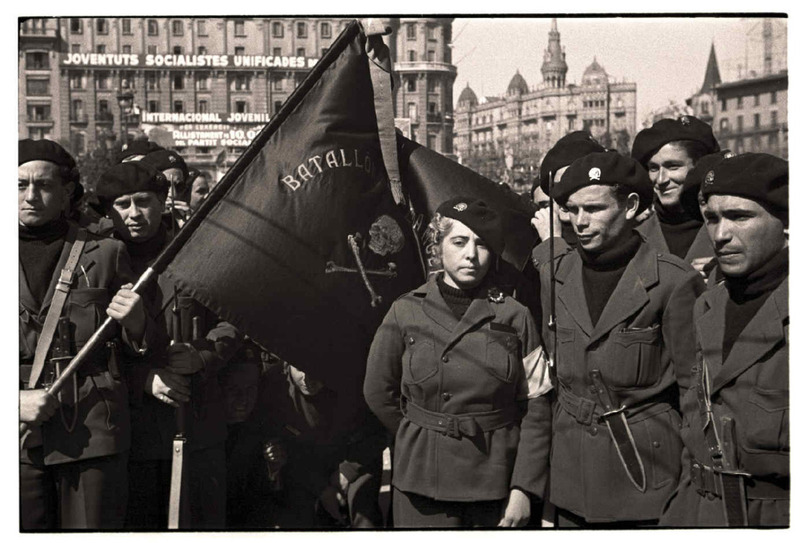 While the Spanish Civil War officially ended in 1939, anarchists and other antifascists kept up resistance against the Franco regime throughout the decades that followed. One particularly notable incident came in Genoa in 1949, when three young Italian anarchists mounted an armed attack on the Spanish Consulate. Finding that the consul himself was out, they evacuated the building, smashed a portrait of Franco, took down the Spanish monarchist and Falangist flags hanging from the window, set a grenade off indoors, and started a fire inside the consul’s office. When their case eventually came to court in late 1950, it turned into “a monster demonstration against Franco”, with evidence against the Franco regime being given by a variety of Spanish anarchist exiles and former international volunteers from the Italian Section of the Francisco Ascaso Column. Faced with the choice of handing down the verdict that Franco regime wanted, or taking the chance to make a stand against fascism, the jury chose to accept that the social significance of attacking Franco’s consulate was a fully mitigating circumstance, and all defendants were acquitted on all charges. In a grimly ironic twist, while everyone involved in the actual attack was cleared, a separate set of charges was brought against another three anarchists for covering the case too sympathetically in the pages of the Umanita Nova (New Humanity) newspaper. They had less luck at court, with Ivan Aiati and Gigi Damiani ending up being sentenced to eight months in prison for their writings about the attack. Russell Means and Dennis Banks, two American Indian Movement leaders, were charged with ten felonies for their role in the 1973 armed takeover of the town of Wounded Knee. Means and Banks did not deny taking part in the occupation, but mounted an audacious legal defence that involved the Fort Laramie Treaty of 1868, which had a clause stating that offenses by American Indians should be heard by tribal courts. Focusing the court’s attention on the treaty allowed the defendants to discuss the wider history of US crimes against American Indians - as they put it, “It's really the United States that's on trial, not us”. Although the case was technically dismissed rather than ending in an acquittal, all jurors were determined to acquit, and the majority of the jurors would go on to publicly advocate that all charges should be dropped against everyone involved in the Wounded Knee occupation. Some of them wrote a collective letter to the attorney general, urging that the government “should for moral and ethical reasons drop the criminal charges against all the other Indian people and their supporters”. Bloody pogroms against Jews were a sad feature of history throughout much of the Russian Empire and Civil War. Some particularly brutal ones were carried out by the Ukrainian nationalist forces in the civil war, under the command of Symon Petliura. Sholom Schwartzbard, a Ukrainian Jewish anarchist, lost fourteen members of his family to pogroms during this time. Eventually, the Bolsheviks defeated both the anarchist forces that Schwartzbard had supported and the Ukrainian nationalists that Petliura had led, and they both ended up going into exile, ending up in Paris by the mid-1920s. Here, Schwartzbard wrote to a friend that “to many, [the persecution of the Ukrainian Jews] is all past history, done with and forgotten. To me it is an open wound, bleeding and sore which can never be healed.” Acting on his beliefs, Schwartzbard tracked Petliura down and shot him dead in the street, telling the policeman who arrived on the scene that “I have killed a great assassin”. This act was widely celebrated across the Jewish diaspora, with the New York Yiddish newspaper Der Morgen Zhurnal commenting “We are not grieved by this incident. Nor are we afraid of the possible consequences. Would that every pogrom leader feel unsafe.” Many Jews contributed to Schwartzbard’s defence fund, and prominent figures such as Albert Einstein offered to testify on his behalf. Schwartzbard made no attempt to deny his responsibility for the killing of Petliura, but simply stated that it was justified as revenge for the pogroms, and his lawyer called a survivor of the pogroms to describe what she’d lived through and then asked the jury to hand down a verdict worthy of France’s revolutionary legacy. The jury complied, setting Schwartzbard free, and awarding the somewhat insulting sum of one franc in damages each to Petliura’s widow and brother. On May 13th 1833, the National Union of the Working Classes, an early English working class organisation, held a rally at Coldbath Fields in Clerkenwell, carrying a banner reading “Death or Liberty”. The crowd was attacked by the newly-formed Metropolitan Police, and in the resulting conflict three police officers were stabbed, with one of them, PC Culley, dying of his injuries. Special thanks go to Past Tense, History is Made at Night, the Kate Sharpley Library, the Tilted Scales Legal Collective, and the anonymous authors of “Pesach is Calling to Us: Towards a Renewed Jewish Anarchism”, without whom this piece could not have been written. If you're a fan of successful legal defences, and would like to see more, consider checking out the Defend J20 Resistance campaign for those facing charges from Trump's inauguration, and the defence campaign for the Stanstead 15 who blocked a deportation flight, and whose case is currently adjourned. Brilliant piece, thanks for writing up!